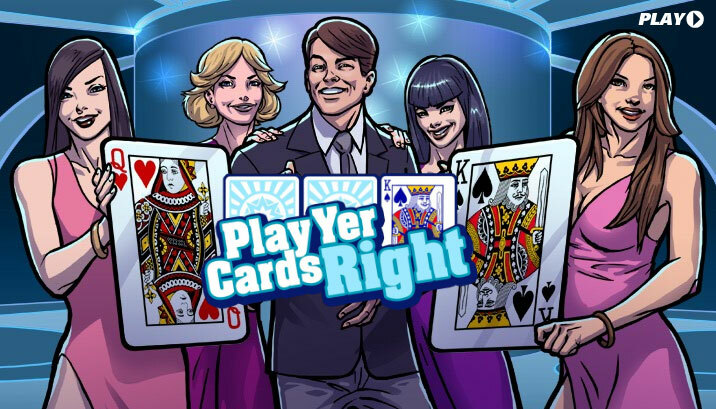 Play Yer Cards Right is a spread betting version of the classic higher or lower game. Played with a single deck of cards, the object of the game is to predict whether the next card out the pack will be higher or lower than the card on display. The game starts with you selecting your opening card and then betting on the number of consecutive correct predictions you think you'll make before predicting wrongly. After each correct prediction you will be offered the chance to take your profit or cut your loss, alternatively, you could choose to gamble and try and go all the way. Before placing a bet, you will be dealt a card face up: this is your starting card and will determine the number of points you'll need to score before making a profit. If you choose to start off with an easy card such as a 2 or a King, you will need to score more points before making a profit than if you were to start with a more difficult card such as a 7. With your starting card, you can choose to keep the one you are given, or alternatively, shuffle the deck and be dealt another one. You can shuffle the deck as many times as you like until you have a starting card you are happy with. When you are happy with your starting card, you must decide your stake. After each correct prediction you will have the opportunity to 'take your profit' or 'cut your loss'. The "Profit" or "Loss" value is calculated using the number of correct predictions [points] you have already amassed and the probability of you predicting correctly on subsequent goes. Every time a card is dealt one of the lights on the table will be illuminated. The lights provide an at-a-glance impression of whether the previous cards have had predominantly high or low values, this should aid the decision process of predicting the next card. A red light indicates a card lower than 8, blue indicates a card higher than 8 and green indicates a card equal to 8. You have 30 secopnds to make each decision: you will see the timer at the top of the screen. Should you allow the timer to run down to zero before choosing higher or lower, the logical choice will be made for you based on probality.